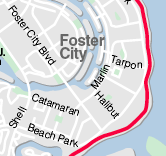 Today I walked around the North/West side of Coyote Point - up to, and around, the Yacht Harbor area and back. There were some nice views of the Bay, boats, and windsurfers. And I enjoyed seeing the distant San Francisco skyline appearing ever closer. However, I'll need to take fewer pictures or walk faster if I'm going to make it through San Francisco by the end Dec. 2009. Make sure you get to Coyote Point relatively early in the afternoon. (Yesterday, (10/29) I attempted this same walk. However, due to the Bay Bridge closure for repairs, thousands of cars were trying to squeeze onto the nearby San Mateo bridge, and by the time I negotiated my way through traffic to the Coyote Point park entrance kiosk, the park person wouldn't let me through as it was too close to closing time. Ah well. I'm determined to keep going, despite natural and man-made inconveniences. Speaking of which, there was construction going on and some detour signs (to to some erosion and collapsed asphalt path) in a few sections (see image). So, make sure you look at a current map first. 22 ducks; 60 Canada geese; 7 Western grebes (in water/Bay); 22 sea gulls; several planes flying overhead (into San Francisco Airport); and 3 crows. This past week, I took a few days off (to walk other areas in the Bay Area); but today I'm back to walking the Bay. Thank you to Marlene, who joined me on my walk today. We first walked south/east (to point where I left off last week), and then north/west, as far as Seal Point Park. The weather was nice, although the breeze was starting to pick up a bit. We saw quite a few feral cats (6). A man appeared to be feeding them, which is probably why they'd come out into the open. 5 crows; 3 cormorants; 2 sea gulls; 4 Western grebes (in the Bay); 2 little brown jobs (LBJs); 3 brown pelicans; 4 snails; 55 unidentified brownish shorebirds; and 15 American avocets -- seen from a distance (and they could have been unidentified brownish shorebirds). The one mystery animal I can identify (see image at right) is the feral cat that was rooting around in the rocks. Today, I finished up the asphalt path (purple line on the map above) running parallel to Port Royal Ave. and Beach Park Boulevard. I dubbed this place big bird land. There were more large egrets and herons (and many other birds) in this lagoon/slough than almost any other place on my walk to date. I actually walked past the north end of the purple line, under the Hillsdale Ave. overpass (white line on map), and kept going a big longer, before turning around and heading back to where I parked the car. 4 cormorants; 3 crows; 89 ducks; 10 snowy egrets; 3 terns; 3 unidentified brownish shorebirds; 2 sea gulls; 16 great egrets; 2 great blue herons; 29 black-necked stilts; 36 coots; 1 brown pelican; 2 killdeer; 1 American avocet; 9 Canada geese; 1 mini-cormorant (under water most of the time, so difficult to study more closely); and 1 black-crowned night heron who appeared to have an egret pal (but, more likely, unwanted competition for a hunting/fishing spot). Today I had the chance to walk (on a path alongside Beach Park Boulevard) and gaze out into the Bay again, after several days of walking next to sloughs and lagoons -- all interesting in their own way. Whoops, misplaced notes; I will have to come back and fill this entry in later. And so, I went right on identifying, and mis-identifying, the wildlife listed below. I can't yet distinguish between the dozen or more similar-looking, brownish shorebirds including curlews, godwits, plovers, sandpipers, yellowlegs, and others. So, my apologies to all these birds. Ditto on smaller, brownish songbird-sized birds, aka little brown jobs, who tend to dart around too quickly. 6 snowy egrets; 1 great blue heron; 10 unidentified brownish shorebirds; 7 little brown jobs (LBJs); 1 crow; 8 pigeons; and 14 snails. 2 great blue herons; 14 great egrets and 15 snowy egrets; 4 black-crowned night herons; 3 crows; 6 Canada geese (on Twin Dolphin Drive - blocking traffic); 12 black-necked stilts; 20 ducks; 1 dragonfly; 1 ground squirrel; 10 little brown jobs (LBJs); and 10 unidentified brownish shore birds. 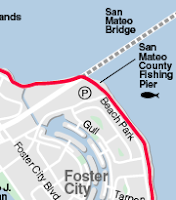 My intention was to park at Island Park, and cross the slough to walk the loop (above Oracle loop) shown (with a red line) on the map. However, I ended up meandering around quite a bit. (It's always a good idea to take map with you.) And, like most wanderings, there are occasional nice rewards for doing so. I overlapped with some of the loop shown, but I'll need to go back and cover the rest. Wildlife Sightings: 1 rabbit; 2 great blue herons; 7 killdeer flying overhead; 1 sea gull; 1 black-necked stilt; 2 ground squirrels on lawns and 1 "regular?" squirrel (is there a difference between tree and ground squirrels? ); 3 crows; 2 ducks; 1 hawk; 5 doves; 2 coots; 2 skippers; 3 little brown jobs (LBJs); 1 tiny little brownish shorebird skittering around cement edge of man-made pond/lagoon; 4 snowy egrets; and 4 unidentified brownish shore birds in mud, near egrets. I almost skipped the Twin Dolphin Drive part of the trail, as this street appeared to be lined with office parks and not very much water or Bay; however there was a nice lagoon with some bird life, and some picturesque views. Wildlife Sightings: 1 cormorant; 4 little brown jobs (LBJs) + 1 mockingbird; 1 sea gull; 30 Canada geese; 9 ducks in lagoon; 1 coot in lagoon; 22 crows; 5 skippers; 1 dragonfly; and 4 little brown birds in lagoon going under water for long periods (that looked like miniature cormorants). In this second walk segment today, I walked along the slough and around Oracle (Parkway). The sun was setting as I finished my walk around the Oracle glass-encased towers. There were several murders (what a great name for a group) of crows filling the sky around the Oracle complex and surrounding waterways. It looked very much like the flying monkeys scene from the movie "The Wizard of Oz." Wildlife Sightings: 10 sea gulls; 2 cormorants; 50 crows; 8 snowy egrets and 2 great egrets; 167 Canada geese (on Oracle lawns - one hissed when I walked too close on the path); ~ 40 little unidentified brown shorebirds on mud/water's edge; 6 ducks flying overhead + 30 in the water; 1 coot; and 2 little fawn/mouse-colored, white-fronted geese with yellow legs and beaks. On today's walk, I repeated and walked some extra ground, just to walk on a few bits of trails I might have missed before. I parked at Shore Dogs Park, and admired the birds across the street in the lagoon, and then walked down Radio Road, until I reached the intersection with Redwood Shores. At this point I walked down the public path to the public parking lot off Canvasback Way. I turned left onto Canvasback Way, left on Shearwater, and left on Redwood Shores Parkway, then back to my car at Shore Dogs Park -- where I'd spotted about 90+% of the birds listed below. Wildlife Sightings: 20 sea gulls; 20 ducks; 2 white pelicans and 1 brown one (flying overhead); 10 unidentified brown shorebirds + 8 with very long bills; 8 little brown jobs (LBJs); 1 cormorant perched on tower; 15 black-necked stilts; 15 American Avocets; 2 Canada geese crossing the street (one limping). I had only an (expired) disposable camera with me this evening; so I doubt I'll have any pictures worth posting. 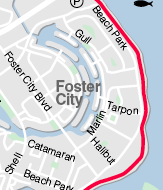 On the first leg of tonight's walk, I ambled from Shore Dogs Park, alongside the Wastewater Treatment Plant, to the end of the trail (red line on map) to gate with closed sign. Salt marsh mice and clapper rail birds are trying to make a recovery here on the other side of the fence. The pre-sunset light and view of ducks and other birds on the large pond nearby was great. However, along with some less wonderful smells, I was engulfed in a cloud of small gnats that were flying at ankle-to-eyeball level; and I had to walk around what looked like a lost carpet on the trail. There also seemed to be a brown haze/cloud hovering over part of the Bay, perhaps due to a fire somewhere. Each walk is full of new discoveries. 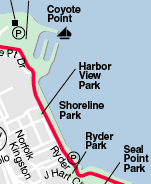 For the second leg of tonight's walk, I drove down to the other end of Radio Road, and parked in a public parking lot, and followed the trail (red line) closest to the Bay to the second public viewing platform (nearest to the intersection of Canvasback Way and Seabrook Court). From this raised observation area, I could see the San Mateo bridge, and the San Francisco skyline is growing closer each time I get a view of it. It was getting dark, but I was treated to a big moon starting to take shape, and a semi-silhouette view of a great blue heron on top of a chimney, on my way back to my car. Sadly, my camera was sitting at home. I'd left my house in a hurry, hoping to beat rush hour traffic on Highway 101 and to squeeze this walk in. 43 ducks; 14 little brown jobs (LBJs); 7 sea gulls; 2 American avocets; 15 black-necked stilts; 1 great egrets and 4 snowy egrets; 2 great blue herons; 4 brownish shorebirds (whimbrels or willets); an uncountable number of gnats; 1 unidentifiable blur in the bushes. We (two women and a dog) had sunny, beautiful weather for a walk today along Steinberger Slough to Shore Dogs Park on Radio Road. As before, there were a lot of birds out in the slough that I couldn't identify or count because they were too far away. Wildlife Sightings: 1 grasshopper; 4 dragonflies; 2 great blue herons; 1 great egret and 2 snowy egrets; 20 ducks; 5 sea gulls; 1 cormorant; and 1 crow.